Old mushy bananas are the best! Last night I went to an orchestra concert, and for some reason I was craving banana bundt cake the whole time, but I've never had it before. Story of my stinking life. I crave things all the time that I've never had. 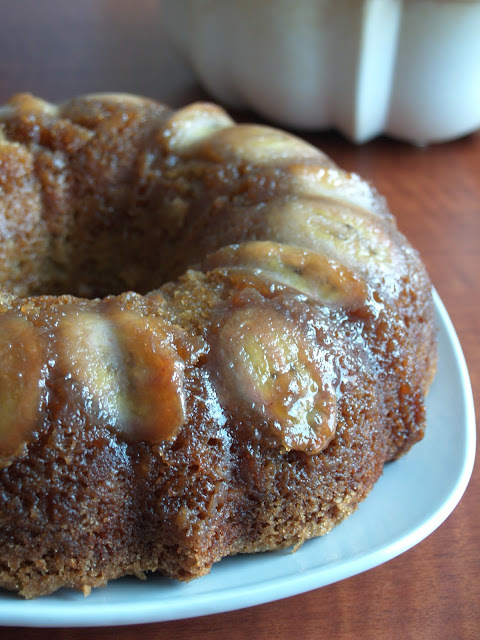 I set out to find a delicious recipe for a moist banana bundt. At first I was searching for something with sour cream to make sure it was moist, but I decided to go with a recipe I found on Pinterest. I'm so glad I did! It was so unbelievably moist. Today was definitely a baking day. I woke up to a fresh blanket of snow covering the ground. It's LATE MARCH! Utah is crazy! Tweaked from Hungry Couple NYC. 1. Preheat oven to 350 degrees fahrenheit. Butter and flour a bundt pan. Lightly tap the pan to release the extra flour. Line the pan with the brown sugar and then the banana slices. 2. Combine the flour, baking powder, baking soda, and salt. In a separate bowl, beat the softened butter and brown sugar. Add the eggs and vanilla and beat. Add the buttermilk and mix. Scrape the bowl. Add the mashed bananas and mix. Slowly add the dry ingredients until it's fully incorporated. 3. Pour into the prepared pan and bake for 45 minutes or until a toothpick comes out clean. Let it cool for about an hour before inverting it out of the pan. Also, yes, in case you were wondering, I do always sing the Gwen Stefani song in my head to make sure I'm spelling "B-A-N-A-N-A-S" correctly. Your cake looks like it has the perfect texture; I will certainly give this a try!